1. Avoid forward bending and twisting the spine. People with osteoporosis often have an abnormal curvature of the spine known as kyphosis. This occurs when vertebrae (bones that make up the spine) weaken and press upon each other. Exercises or activities that require forward bending can worsen this hump-backed posture and increase the risk of severe injuries. For this reason, exercises such as sit-ups, curl-ups, and toe touches, all of which involve forward bending, should be completely eliminated from any osteoporosis exercise program. Twisting (rotating) the spine also puts great pressure on the vertebrae (see image). When forward bending and twisting is done at the same time, the stress on the spine is greatly increased. Also, be careful to avoid forward bending and twisting not only during exercise but also during day to day activities such as lifting, vacuuming, sitting, and sneezing. 2. Do not lift a load forward and away from the body. Avoid lifting a weight forward and away from the body when you are exercising (see image). This can put a lot of stress on the back and cause forward bending of the spine. 3. Do not lift a weight above shoulder height. Do not perform exercises that require lifting a weight above the shoulders as this causes a tendency towards forward bending. This increases stress on the spine and may lead to injuries. 4. Avoid jogging, jumping, and skipping. Jarring of the spine during jogging, jumping, and skipping can cause spinal injuries. Try speed walking instead. Can someone with osteoporosis do Pilates or yoga? 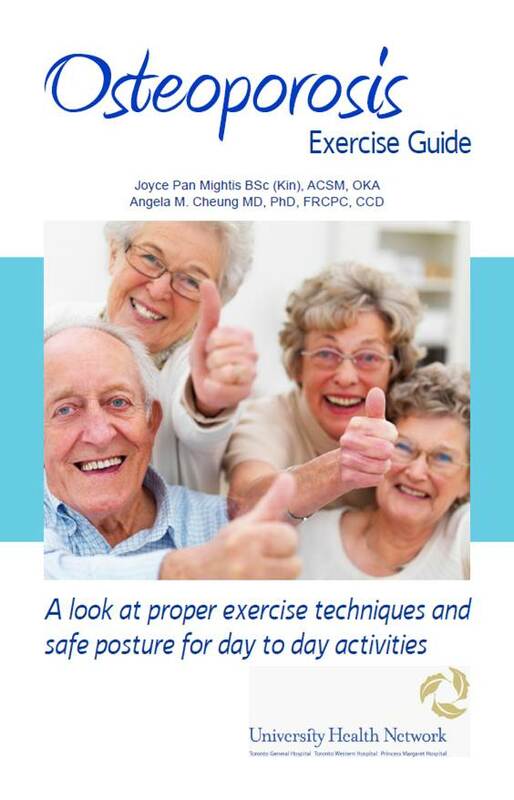 For each person, it will all depend on the severity of osteoporosis, history of previous fractures, one’s muscle strength as well as considering the safety of each movement, and doing the exercises correctly (using the right muscle group). If someone has osteoporosis, it is better to discuss their exercise routine with a physiotherapist or a Bone Fit trainer (https://www.bonefit.ca/map-locator), to make sure that the types of Pilates or Yoga movements they do are safe. QUESTION: Precautions for Osteoporosis Exercise says specifically not to hold a weight up and away from the body, but the Upper Body Exercise video shows exactly that exercise as the 4th exercise. Please can you clarify this. ANSWER: My recommendation to you is that if you already have osteoporosis, we would recommend avoiding the 4th video exercise that you mention. You can do the 3rd video exercise, where you are raising your arms up and sideways (instead of in front of you), and it will also work out your shoulder muscles and bones. An issue with the 4th video exercise is that it is easy to move your arms up past your shoulders and once you go past your shoulders the pressure in the upper spine can be too much for fragile spine bones (vertebrae). If you have low bone mass but you don’t yet have osteoporosis, you could opt do the 4th video exercise, but preferably with lower weights and never move your arms past your shoulders, so as to avoid compression of the spine. 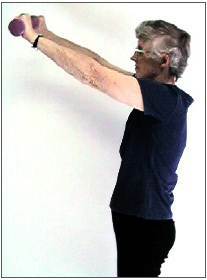 The advantage of doing the 4th video exercise is that it works out your front shoulder muscles a bit more than the 3rd exercise video, and the front shoulder muscles help to keep arms up in front of you (for example, people who need to hold on to walkers, may be able to hold on to it harder and for longer if their front shoulder muscles are stronger). The “Precautions” are mainly focusing on lifting loads during daily activities. For example, if you are picking up a heavy bag of flour and trying to put it up on a shelf that you need to reach by raising your arms up and past your shoulders, and you have osteoporosis, you are putting your self at a risk of fracturing your spine. So always try to avoid lifting something up past your shoulders during daily activities. Instead, try to hold the flour bag close to your chest and step up on something, so you don’t have to raise your arms up. Or ask someone to do it instead, if you are worried about losing a balance when stepping up on something. Or avoid storing heavy things on high shelves so you don’t have to lift heavy loads in front of you and past your shoulders. We are sorry to hear about your mother’s pain. We would suggest that you consult your physician with regard to your specific question. If your doctor would like one of our physicians to see your mother, please ask him/her to fax a referral with detailed information to (416)-340-3750.